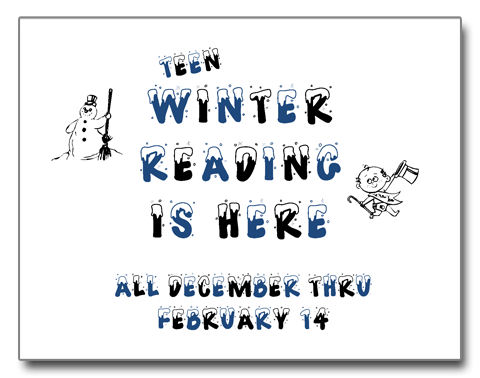 Teen Winter Reading is Here! Read a great book lately and can’t wait to tell someone about it? Like getting rewarded for writing book reviews? Then get in to the library to participate in the Teen “I ♥ Books” Winter Reading Program. All December, January, and ending on February 14, drop off or submit online your book reviews. Each book review counts as one entry into the February 14th “I ♥ Books” prize giveaway! Come to the library to find out more.